Irvin D. Yalom has made a career of investigating the lives of others. 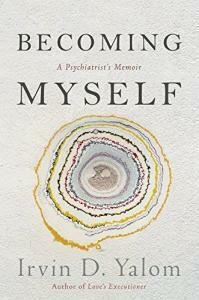 In this profound memoir, he turns his writing and his therapeutic eye on himself. He opens his story with a nightmare: He is twelve, and is riding his bike past the home of an acne-scarred girl. Like every morning, he calls out, hoping to befriend her, "Hello Measles!" But in his dream, the girl's father makes Yalom understand that his daily greeting had hurt her. For Yalom, this was the birth of empathy; he would not forget the lesson. As Becoming Myself unfolds, we see the birth of the insightful thinker whose books have been a beacon to so many. This is not simply a man's life story, Yalom's reflections on his life and development are an invitation for us to reflect on the origins of our own selves and the meanings of our lives. "Fans of this eloquent and introspective author will welcome this innermost chronicle of his history, passions, and the keys to unlocking a fruitful life." "Becoming Myself offers a rich exploration of some of the author's favorite themes with a rare honestly, openness and generosity. "